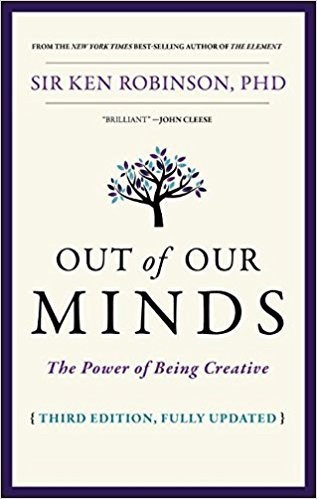 Out of Our Minds: The Power of Being Creative by Sir Ken Robinson explains how much of today’s education is standardized and how we need to make it much more personal in nature. He believes that everyone has a creative capacity and that it’s the schools’ job to facilitate imagination, creativity, and innovation for all. Leaders and teachers in education and all in walks of life should read this book. As change becomes more frantic, the more creative we need to be. Most organizations recognize this. Unfortunately, while most children think they are creative, most adults think they are not. In this book, Sir Ken takes on why it is essential to promote creativity, the problems with doing so, and how to do it. First, we rely on our imagination to bring to mind things that are not present to our senses. Creativity then is the process of developing original ideas that have value, and innovation is the process of putting new ideas into practice. Everyone has creative capacities. The challenge is to develop them. There is a consensus among people in business that they want people who are literate, numerate, who can analyze information and ideas; who can generate new ideas and implement them; and who can communicate clearly and work with other people. Unfortunately, they have worked to impose a culture of standardization and testing that stifles the creativity of students and teachers alike. This may be no surprise as corporate history is littered with the wreckage of companies and industries that were resistant to change. Meanwhile, parents and kids want education to help them find work and become economically independent; and to identify their unique talents that will help them lead a life that has meaning and purpose. Real life is not linear or standardized; it is organic, creative, and diverse. Ken starts with reviewing the histories of transformative inventions, communications technology, and computers. This gives you a clear notion that the rate of change and innovation is speeding up. It also shows that what was impossible yesterday is routine today. He then takes a look at some possible futures involving things like nanotechnology. In order to deal with the increasing pace of change, Ken feels that our best resource is to cultivate our ability to imagine, create, and innovate. Doing this has to be one of the principal priorities of education and training everywhere. In short, education is the key to our future. Employers say they want people who can think creatively, who can innovate, who can communicate well, work in teams and are adaptable and self-confident. They also complain that many graduates have few of these qualities. This is not surprising as conventional academic programs are not designed to develop them. We are creating more college graduates than we need and many end up taking jobs for which they are overqualified. The system has intensified programs of standardized testing in language and math with many harmful side effects. Achievement in literacy and math has scarcely budged and subjects viewed as nonessential have suffered. Students who fail to graduate or who graduate but aren’t ready for college suffer even more. It is clearly time to rethink some of our basic ideas about education. Reform is not enough. Education needs to be transformed. 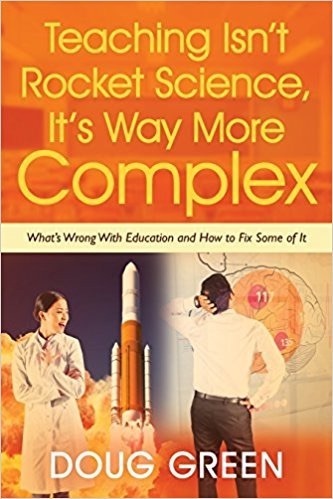 This entry was posted on Monday, April 2nd, 2018 at 7:26 am	and is filed under Book Summaries, Education Books, Leadership Books. You can follow any responses to this entry through the RSS 2.0 feed. You can leave a response, or trackback from your own site.